Well, we’re in the thick of it now. Up to our elbows in wrapping paper, scrabbling to find the beginnings of the cellotape roll and getting ourselves tangled into knots along with the fairy lights. As the frenzy of present shopping begins to subside it’s time to turn our attention to the food preparation. With visitors dropping in unexpectedly it’s a good idea to have some stand-bys to hand so that you can very quickly whip up a tasty morsel or two to serve with the mince pies. 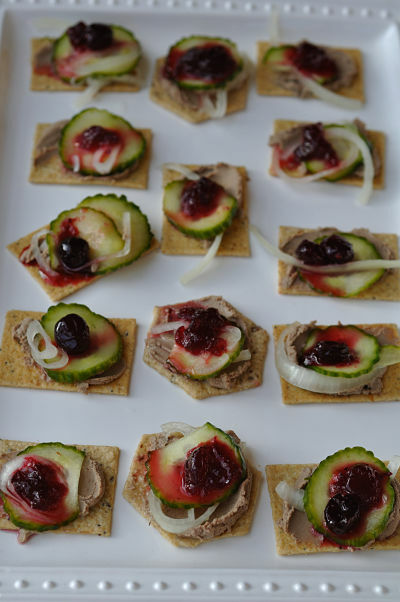 The inspiration for these canapes came from my annual trip to the Christmas Food & Wine Magazine Show in Dublin where Moloughney’s were one of the exhibitors. To say I was inspired is an understatement as what I have done is more or less replicated one of their offerings at the show. 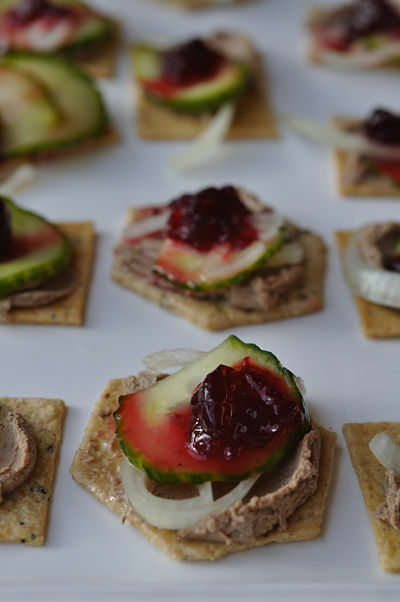 I’ve used their spiced cranberries along with some locally sourced chicken liver pate and a home-made pickled cucumber to produce a very simple yet impressive looking canape. I picked up the chicken liver pate at Mahon Point Farmer’s Market last Thursday. 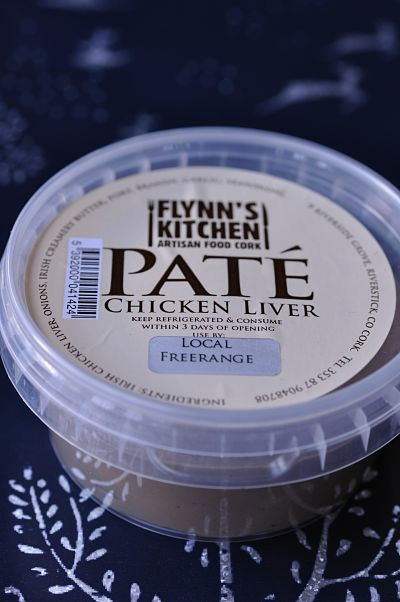 This delicious free-range chicken liver pate is made by Flynn’s Kitchen and was an award winner at Blas na hEireann 2011. 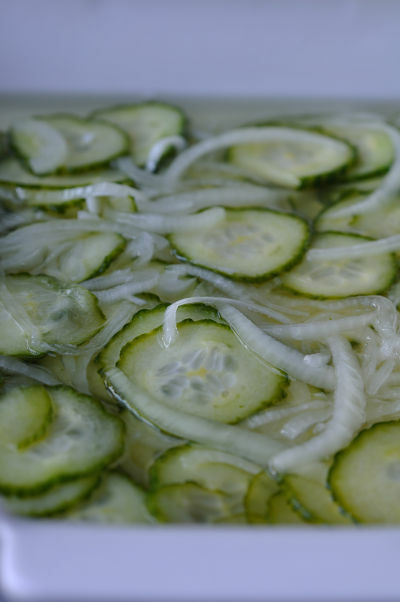 Good quality pickled cucumbers are easy to pick up pre-made or you could use this simple Clodagh McKenna recipe to make your own. 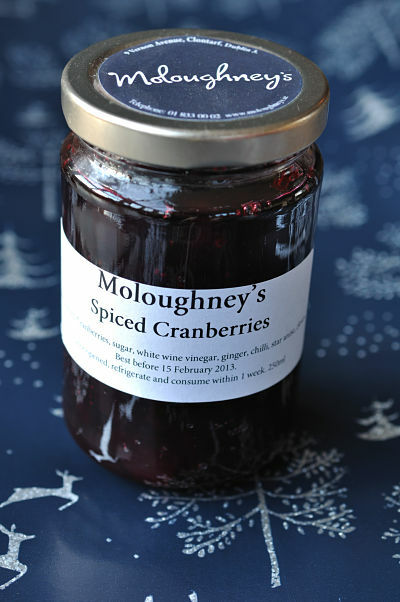 It should keep well for 3-4 weeks if stored in an airtight container in the fridge. Peel and very thinly slice the cucumber and the onion into a large bowl. Add the sugar, cider vinegar and salt and give it a stir. Cover with cling-film and store overnight in the fridge. Dispense into airtight containers, jam jars etc. and use within 3-4 weeks stored in the fridge. 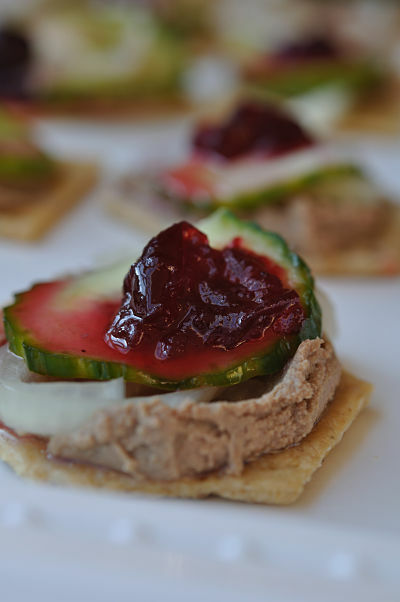 Spread some pate on the crackers and top with the pickled cucumber and spiced cranberries. Those canapés look scrummy and I’m sure any guests would be thrilled to be offered them! I love cucumber pickle. It’s actually one pickle that I make annually and even though it loses some of it’s green colour, it really keeps for months in the fridge.